VAT affects us all, both as individuals and as business people. The information below is aimed at helping you to understand what VAT is, how it is administered and what is required of those running businesses. VAT is a tax which is chargeable on supplies designated by the government as taxable and which are made by those defined as ‘taxable persons’. Where VAT has been paid to other businesses, credit is given. The net balance is payable (or may be reclaimed), usually quarterly. VAT applies to the supply of any goods or services. This includes sales, hire and loan of goods and may be of a revenue or capital nature. Vatable turnover for the past twelve months exceeds £77,000. There are reasonable grounds for believing that your turnover for the next 30 days will exceed £77,000. In the first case, notification must be within thirty days of the end of the relevant months. In the latter case, notification must be within thirty days of the date on which grounds first existed. You need to monitor your turnover constantly because if you fail to spot that it has reached, or is about to reach, £77.000 and are therefore late in registering, there will be a penalty to pay, as well as the tax for which you are liable. You may, if you wish, register voluntarily for VAT, provided you have a bona fide business. This is a special scheme which is applicable to businesses where taxable turnover is not expected to be more than £1,350,000 in the next 12 months. It allows the trader to account for VAT on the basis of payments received and made rather than on tax invoices issued and received. If you wish to take advantage of this scheme you should consider using cash accounting from the date you register. This scheme will not necessarily be the best one for you; I will be able to advise you on this. There are special schemes of accounting for VAT available to retailers. Again, I will be able to advise which, if any, of these schemes would be best for you. Tax you pay on purchases (input tax) can be recovered if you are a registered taxable person. In practice, are able to offset input tax against your output tax liabilities. If you are a traders with fully exempt outputs, you are not able to register or reclaim any input tax. You are not able to claim credit for VAT paid on things such as private expenditure, business entertainment, motor vehicles, certain building materials and goods bought second-hand. In all other cases credit can be claimed provided you have a VAT invoice. If your business makes taxable and exempt supplies, there may be some restrictions on what you can recover. You will be issued with a return each quarter, which you will be required to return within thirty days of the end of the quarter. Late returns are subject to a penalty in addition to the tax liability. Although quarterly returns are the norm, some businesses make monthly returns and there is an Annual Accounting Scheme where returns are made once a year within two months of the end of the accounting year. HM Revenue & Customs (HMRC) have begun the process of phasing out paper VAT returns. From April 2012 nearly all businesses have to submit their VAT returns online and pay any VAT due on that return electronically. Paying electronically will normally carry an entitlement of up to seven extra calender days to submit the return and pay the VAT. The extended due date will be shown on the online VAT return. Cleared funds must reach HMRC's bank account by this date. You will, of course need to keep your records; I can advise you on this and can file your returns for you. Changes in circumstances may require you to deregister or make it advantageous to do so. If you cease trading, you must deregister. If your anticipated turnover for the coming year is less than £75,000, then you are able to deregister. This may or may not be best for your business. I will be happy to advise. Where a supply is zero-rated or exempt, there is no requirement for a VAT invoice to be issued. However, it is useful to issue such an invoice to identify that VAT has not been charged. There is no requirement to issue a VAT invoice where supplies are direct to the public unless the customer requires one. If you pay electronically, then up to seven extra days are allowed for the return and payment to reach HMRC but you will still need to pay attention to payment clearance times. In the case of a Direct Debit, as well as the extra 7 calendar days there will be a further 3 working days before payment is collected from the payer’s bank account. It is your responsibility to keep up to date with VAT requirements. This can be difficult when you are concentrating on running your business. I pride myself on being fully up to date, not only with VAT requirements, but with all legislation connected with book keeping and can relieve you of the burden of compliance. If you have any enquiries or would like further information on the services provided, please feel free to contact me. 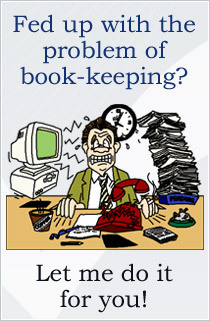 Some of my services are; Bookkeeper Dorset, Payroll and self assessment Tax Return Dorchester.